Got some beautiful swordfish steaks? Dress them up with a condiment that's worthy of their awesomeness, like this delicious leek cream sauce. Heat greased grill to high heat. Brush fish with oil. Grill 3 to 4 min. on each side or until fish flakes easily with fork. Meanwhile, melt butter in medium skillet on medium heat. Add leeks; cook and stir until tender. Add remaining ingredients; cook on low until cream cheese is melted and mixture is well blended, stirring frequently. 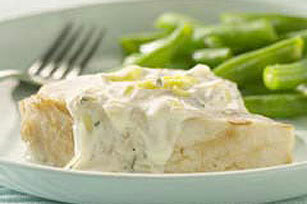 Serve with a hot steamed vegetable and whole grain rolls for an elegant dinner for four. Prepare using PHILADELPHIA Cream Cheese.